Draw the trig substitution triangle for the secant case. The figure shows you how to fill in the triangle for the secant case. Notice that the radical goes on the opposite side of the triangle. Then, to fill in the other two sides of the triangle, use the square roots of the two terms inside the radical — that is, 1 and 4x. 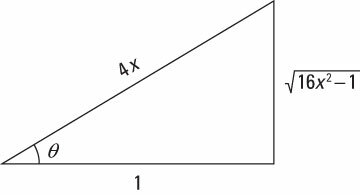 Place the constant 1 on the adjacent side and the variable 4x on the hypotenuse. Identify the separate pieces of the integral (including dx) that you need to express in terms of theta. Express these pieces in terms of trig functions of theta. In the secant case, all trig functions should be initially represented as tangents and secants.